Ephraim’s Christmas in the Village. Photo submitted. Saturday, Dec. 1, will be a busy day in the county. 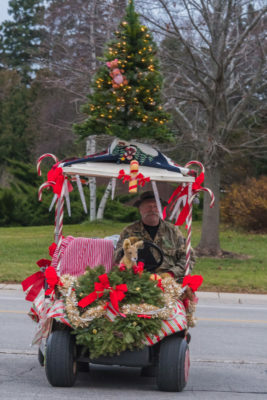 From Sturgeon Bay to Baileys Harbor and Ephraim, there are many options to get in the festive spirit this weekend. Many of the following celebrations are, or are becoming, holiday traditions with families. If you’re really ambitious or just a really big fan of Christmas, the times of the events are spread throughout the day, so you could possibly stop at all three events. Ephraim Business Council presents the annual Christmas in the Village celebration with festive activities and treats to celebrate the holidays with family and friends. The free, family-friendly event begins with holiday stories and crafts at the Ephraim Library at 10 am. The tree lighting and caroling then take place at the gazebo in Harborside Park at 11 am. Enjoy the beauty of one of Ephraim’s iconic churches and attend ADVENTure and the Sweets for the Holiday sale at the Ephraim Moravian Church from 11 am to 2 pm. The church will have angels on display and discuss the many Moravian Christmas traditions. Attendees can purchase a warm lunch and treats from the cookie sale in the Ephraim Village Hall beginning at 11:30 am. Santa’s Workshop will provide many exciting children’s crafts and cookie decorating from 12 to 3:30 pm. A raffle ticket sale is new this year and tickets will be drawn every 15 minutes to win fun Ephraim prizes. Children will have the opportunity to meet Santa and tell him their wish list from 1 to 3 pm. Attendees are encouraged to bring their cameras or phones to take photos. 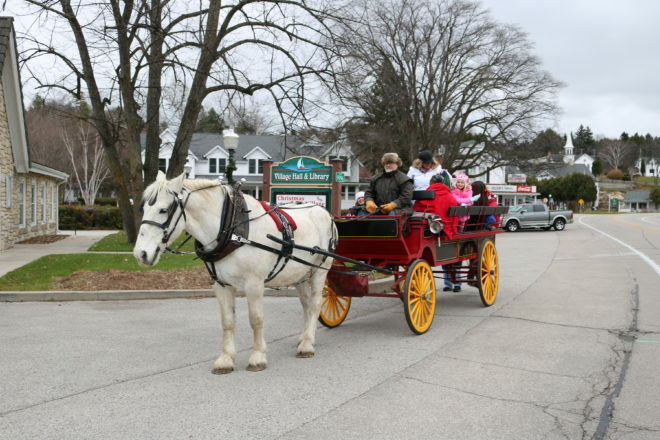 After visiting with Santa, take a horse-drawn wagon ride and enjoy the beauty of Eagle Harbor from 1:30 to 3:30 pm. Explore local Ephraim businesses at various open houses. From 1 to 4 pm, seven businesses will open their doors with holiday decorations, treats, activities and sales. Admission is free to events, but attendees are encouraged to bring nonperishable food donations for the Door of Life food pantry. For more information visit ephraim-doorcounty.com. Harbor Holiday in Baileys Harbor. Photo by Len Villano. During its annual community holiday event, Baileys Harbor will hold a Christmas parade of lights, arts and crafts, and a tree-lighting ceremony. Take a stroll through downtown to check out all the trees that local businesses and families have decorated before the parade. The parade goes down Guy Street and follows Santa on a fire truck to the town hall, where the party then starts. The Baileys Harbor Historical Society is putting on a fun-filled holiday event full of arts and crafts in the Town Hall. There will also be the first of the Winter Farmers Markets at the town hall on Sunday, Dec. 2, 10 am–2 pm. To register for the parade, email [email protected] or call 920.839.2366. 7pm: Music from Chicago Farmer, Door County Brewing Co.
Santa on the tug boat in Sturgeon Bay. During the Merry-Time Festival of Trees at the Door County Maritime Museum in Sturgeon Bay, kids are invited to meet Santa on the museum’s historic tug, John Purves. 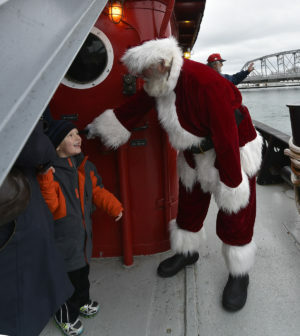 From 10 am to 1 pm, Santa will be aboard the tug greeting kids and listening to their Christmas wishes. Santa’s visit to the museum coincides with Fun Kids Day, held 9 am to 1 pm. Kids and their families are invited to go through the new shipwrecks exhibit, do crafts, play games and much more. There is also a Toys for Tots box in the lobby if families would like to donate something. Due to the size of the tug, only two adults can accompany a child to see Santa. Kids receive free admission on Dec. 1, and adult admission is $10 (this includes a Merry-Time Festival of Trees raffle ticket for a chance to win an elaborately decorated Christmas tree). For more information, visit dcmm.org.